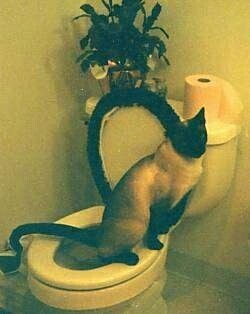 This is a Siamese cat really using the toilet!! Wouldn't we all love to teach our cats how to use the toilet?! "We had recently found this little guy living behind a dumpster. We decided to keep him confined in the bathroom and let him out under supervision until he was comfortable with us and his surroundings. He was quickly adapting to being a pampered house kitty but he still was very timid about everything. I had just checked on him and he was sleeping in his bed in the shower, 20 minutes later I got a huge laugh as I opened the door to this sight." This is Chub the cat. Chub is one cat who has definitely earned his name! 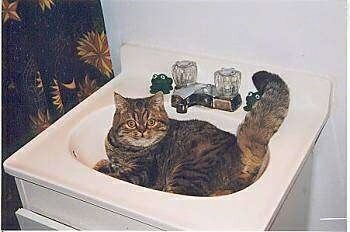 Cloe spends most of her time in the sink, waiting for her owner to turn on the water so she can drink. 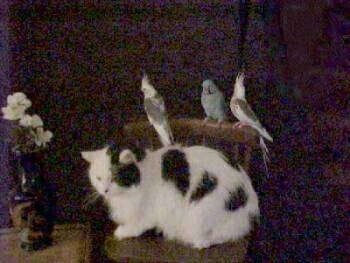 Talk about a cat who loves EVERYONE!! 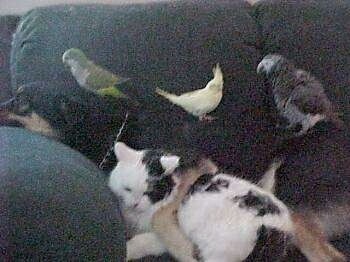 Buttions sure is content with her dog and bird friends! 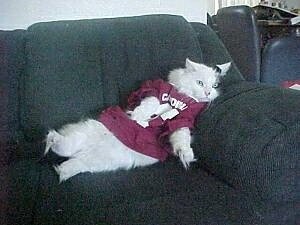 Just hanging around, watching a little TV. 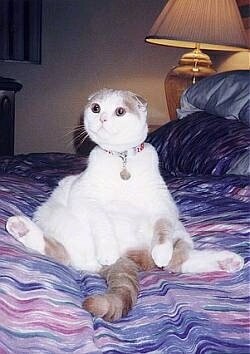 This is Merlot, a Scottish Fold cat who regularly "sits" like this. He weighs 23 pounds (10.5 kg).